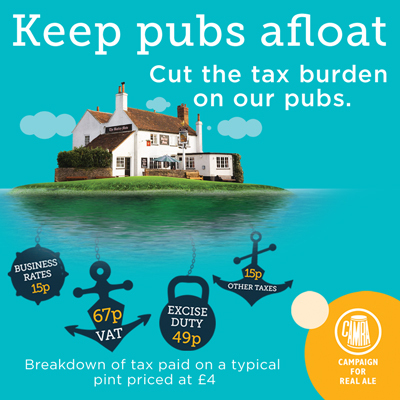 Did you know that a third of the cost of a pint is made up of tax? Pubs facing a triple tax whammy of one of the highest rates beer duty in Europe, rapidly rising business rates, and VAT. This high level of tax is squeezing publicans and forcing them to either put up prices for consumers or close their doors forever. 14 pubs are now closing their doors each week. As the UK prepares to exit the European Union, the Government will have the freedom to reduce Beer Duty specifically in pubs – levelling the playing field between the price of beer sold in social, community settings and cheap supermarket alcohol consumed at home. This move is one of three key measures CAMRA believes the Government needs to take urgently to halt the tide of pub closures. It would ensure that pubs are supported, while tax isn’t lowered on the unregulated off trade.